Rabbit Stew: Fieldcraft: Doing the Crawl. I went out yesterday afternoon to find that the farmer on whose land I hunt was grazing his cattle on the fields in which I most often look for rabbits. Seeing this, I set off away from the herd, towards a part of his land where I've not hunted before. I didn't do this in the expectation that I'd have any luck; there's a pleasing novelty at finding one's self in terrain that's less well known, but, since so much in hunting seems to depend upon a detailed knowledge of the land, fresh fields seem like a real challenge. I climbed a fences and then - after using the trunk of a fallen willow as a bridge over a brook - started to walk cautiously up into the field. I've become more aware, recently, of the runs that rabbits create in the grass around their burrows - the indented highways they make by running over the same paths in the fields; and so, when I noticed, up ahead, a convergence of runs towards a burrow under a fence, I decided that here might be as good a place as any to lie in wait a while. I lay down on the ground, downwind of the burrow and used the roll of my camouflage gun slip as both a prop for the rifle and a partial screen to hide myself behind. Hunting in mid-afternoon still feels like a strange thing to be doing; despite having had a good deal of luck at this time, of late, I still can't seem to fully convinced myself that it's not a complete waste of time to lie in a field in broad daylight. Thirty minutes of lying still and seeing nothing later, I was again beginning to think that this was folly. To relieve the tedium, I sat up and cast my eyes around. Over on the far side of the field I noticed a wooden fence running up a rise in the ground and, in a dark area between two clumps of grass, saw a little reddish-grey lump that raised my attention. 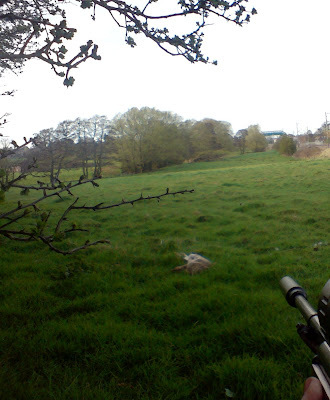 I swung the rifle round and peered through the scope to find that - about a hundred and twenty yards away - there was indeed a rabbit sitting there, placidly looking out at the field. The ground was completely flat between myself and the rabbit and I was in plain view - so attempting to move closer for a shot was hopeless. I decided I'd get up, double back and then cross the field to the bottom of the fence line and try and work my way up towards it. When I got up, of course, it vanished straight away; I was hoping that, after it had recovered from the shock of seeing me, it might venture outside again after I'd moved myself to within shooting range. Once I'd got there, however, I realised at once that there was no good place to lie; twenty five yards downwind from that burrow was a muddy area in a gully from which I would be able to see almost nothing up ahead of me. Giving up on this spot - and close to giving up all together - I started to walk up the rise towards the corner of the upper part of the field. As I started to walk I noticed, up the field ahead of me, the flash of a white tail hopping away. I crouched and looked through the scope and saw that this rabbit had come rest just beyond the brow of the rising ground. I realised that its position would work in my favour if I crawled up the hill towards it since, by staying close to the ground, I could stay below the level that the rabbit could see. I dropped my bag, lay down flat on the ground and, cradling the rifle across my arms, set off up the hill by moving my elbows and knees to propel me. I've not done much crawling in fields; the weather up till now has meant that the ground has been too muddy to do this without getting covered in mud and cow dung. But yesterday the ground was fine - keeping away from young stinging nettles was the only real problem. As I've not done much stalking on all fours with a gun, I'd not really figured out how to do it all that well, but yesterday, after about thirty yards, I found that I was learning how to get a good rhythm going and cover the ground at a decent rate. I stopped now and then to check through the scope that the rabbit hadn't moved and also to try and figure out, using the distance-guide reticule in the scope, how close to it I'd got. I managed, eventually - and all the time feeling quite astounded that I'd not scared the animal away - to close the distance to thirty yards. Sensing something perhaps, it hopped a little further up the field away from me and I raised the rifle to judge its distance again. Just then, another rabbit hopped out from under the fence straight ahead of me, about twenty yards away. I took a shot at it at once - rather hurriedly - which didn't quite do the job, so I got another one off, and quickly, which thankfully did. I gutted the rabbit and thought for a while about staying on to try and get another one from this - as it had turned out - very promising new field, but I decided against it and started for home. I'm out of work at the moment and, looking at the local job market, there's little to feel enthused about; it's easy - for me at least - to become rather gloomy about this. So what a welcome and happy tonic it was to walk home from the fields with dirt on my elbows and knees and a rabbit for dinner; with the feeling that today, in this endeavour at least, I'd achieved something. I've been following your blog for some time now. I appreciate how not beoing able to get a job would make you feel less that appreciated but look on the bright side - your field craft is improving by leaps and bounds. In some ways you are lucky - the choice to participate in one "form of life" has been taken away from you, biut it has perhaps forced a far richer form of life on you. Great writing on the challenges of close-in stalking. As an airgun lover myself, I'm thinking of trading in my .22 rifle for my Beeman R7 when next squirrel and rabbit season get under way (May 10th in Tennessee, not that I'm counting or anything). Of course, I'll be a bit more limited on range should I do that, but stalking can be fun too. What gun are you using for your hunting? I'm using a Weihrauch HW80k. I think it's probably very similar - if not identical - to the Beeman R1 - except I think that the R1 is not limited to 12ftlbs. The HW80/R1 is produced originally at 18ftlbs but they have to be limited in the (rather paranoid) U.K as a result of the air gun legislation over here. If I look back on the guns I've sold I tend to think, 'Gosh, I wish I still had that!'. So I suppose I'd say hang on to that .22 if you can and get yourself an air rifle as well maybe! You're right of course: I certainly don't lie in the fields with my rifle and think, 'Good Lord, I wish I was in an office right now!' Far, far from it. And yes, I value the liberty I've had to learn how to hunt; because, as you kindly say, I have got a little better at it over time - though the Spring and the arrival of rabbits who are less wary than their wise old parents has undoubtedly helped a great deal! It's always good to hear from you. Maybe us huge-bearded old backwoods bloggers should have a beer sometime and compare our Grizzly Bear scars? Great job on the rabbit. That low crawl is something eh? especially for us middle aged fellows! I would like to remind all of our friends to please help our fellow bloggers out by checking out their sponsors! Every little bit helps in these difficult times! You all should consider joining the Outdoor Bloggers Summit. It is an outdoor bloggers group that helps new and established bloggers with all sorts of blogging and outdoor issues. We also do guest post on outdoor politics, outdoor issues, the environment, basically anything to do with the outdoors. Some of us fish, others bowhunt, camp, whitewater canoe, and some are Falconers or Hawkers. It would be great if you joined! A question for you - do you ever forage from the fields? Your mention of stinging nettles brought the http://fat-of-the-land.blogspot.com/ blog to mind, what with his posts on stinging nettle pesto and other recipes. Congratulations on the rabbit! I shall look out the window at snow covered with volcanic ash and wistfully cheer you on! It's very nice to get a comment from a flying blogger in Alaska! I'm certainly interested in ways to find dinner that don't come within the bizarre 'Food is that which comes from Supermarkets' mindset, yes - but nettles I can only really see as being those damn things which sting my wrists when I'm after a rabbit!